The list of excuses for keeping U.S. interest rates where they are has grown tiresome. Since the first post-crisis hike in December, the Federal Reserve has been stuck in the 0.25-0.5 percent range. One plausible explanation for Fed Chair Janet Yellen’s fidelity to low rates may be that it’s all relative. It’s clear from her testimony in the Senate on Tuesday that the UK vote on leaving the EU, set for Thursday, was a factor in not raising rates last week. The U.S. economy, however, is growing steadily if not spectacularly. Job creation, despite a recent blip, has been solid. Some 10 million new positions have been added since the nadir in 2010. Fed folks used to talk of “normalizing” policy, meaning raising rates to a level that suits economic conditions. By way of comparison, the average overnight fed funds rate in the 50 years to 2009 was just shy of 6 percent. 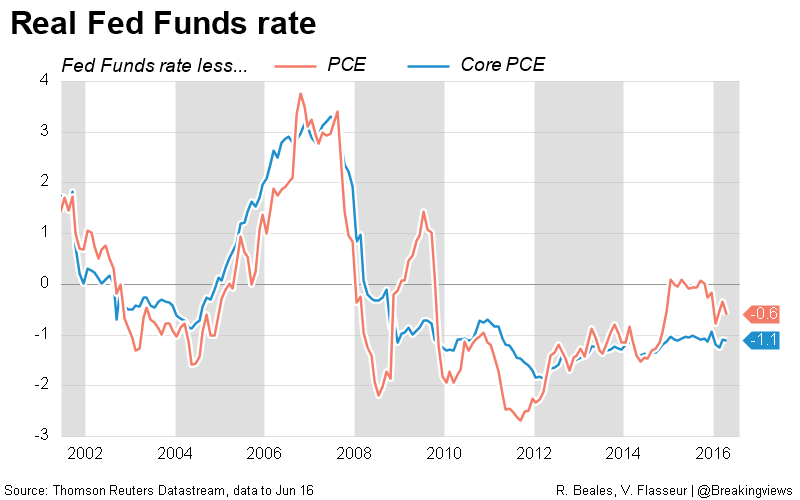 With inflation in abeyance, though, the real fed funds rate, net of inflation, is worth consideration. At roughly minus 1 percent, it’s in less extreme territory relative to the past. Even so, it is hardly “normal” that short-term safe returns should fall short of price increases. St. Louis Fed President James Bullard last week went further, unveiling a shift in his formerly hawkish stance to one that sees the U.S. economy in its current state meriting a fed funds rate of just 0.63 percent. That is tantamount to only one more increase between now and 2018. It’s a position even more dovish than Yellen’s. She does have to consider how events overseas might affect the U.S. economy, though. Beyond the worry about Brexit, other central banks like the ECB and the Bank of Japan are still loosening monetary policy rather than tightening it like the Fed. 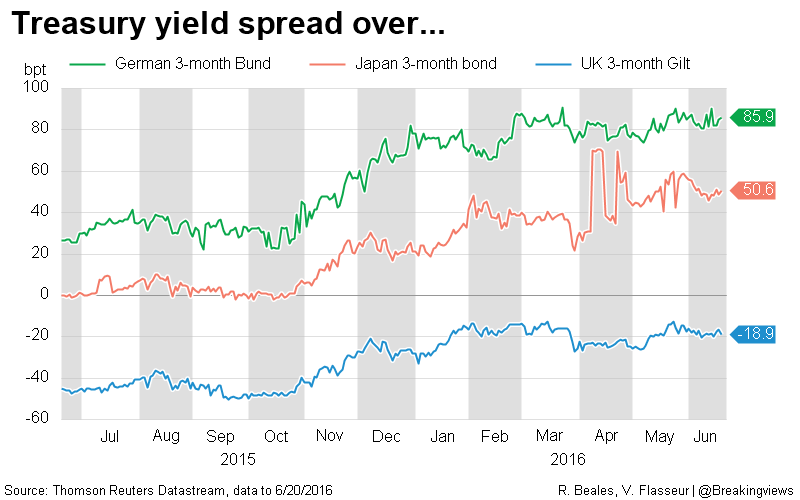 For short maturities – say three months – U.S. rates have ticked up relative to Europe, Japan and the UK since the latter part of 2015 when the Fed last raised rates. The problem is that a forecast that imagines the U.S. economy continuing in a subdued kind of equilibrium probably represents the least likely actual outcome. Surprises, good or bad, are certain to intervene. Yellen and her colleagues seem well attuned to the bad, like Brexit. Good ones, however – along with good trends that turn bad, such as resurgent inflation – could catch them looking relatively flat-footed. U.S. Federal Reserve Chair Janet L. Yellen in Philadelphia, Pennsylvania, U.S., June 6, 2016. 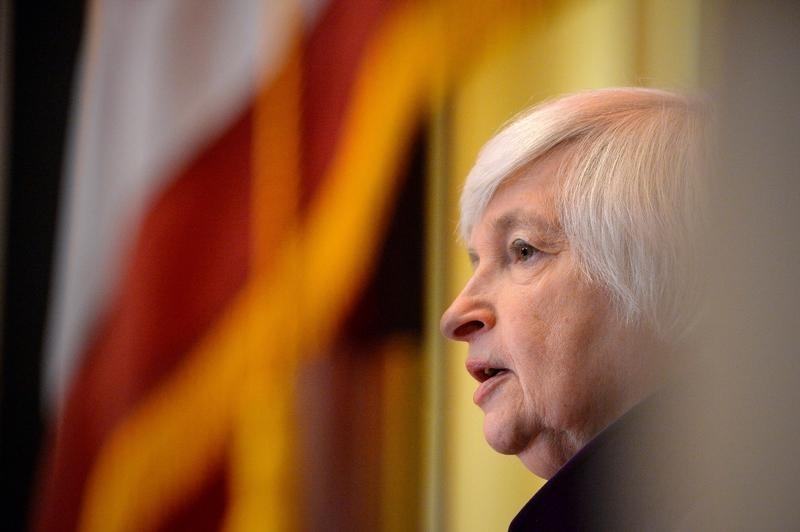 Global risks and a U.S. hiring slowdown warrant a cautious approach to raising interest rates as the Federal Reserve looks for confirmation that the country’s economic recovery remains on track, Fed Chair Janet Yellen said on June 21. Before a further tightening of monetary policy, she said in prepared testimony before the Senate Banking Committee, the Fed needs to be sure U.S. economic growth and hiring have rebounded and there is no shock from the outcome of Britain’s June 23 vote on whether to leave the European Union. The U.S. economy may only need one interest-rate increase for as long as 2-1/2 years and the Federal Reserve is eroding its credibility by indicating otherwise, St. Louis Fed President James Bullard said on June 17. Bullard said he felt the appropriate federal funds rate is around 0.63 percent, roughly a quarter point above where it stands, and will likely stay there “for the foreseeable future.” Formerly an advocate for rate hikes, the regional Fed boss has been rethinking his view of the current path of the U.S. economy.